I take shelter of Krishna’s playground named Āsthānī at the base of Nandishwar Hill. It is a beautiful pavillion, lovingly made of large stones, by expert architects, set in a square shape. There Sri Krishna plays many fun games with his friends; thus it is anointed by the fragrance of Sri Hari’s lotus feet. Sri Nandishwar Hill is the abode of many of Sri Govinda’s pastimes, and it is most dear to Vrajendranandana. sambhrājate priyatayā vrajarāja sūnor govardhanād api gurur vraja vanditād yaḥ (Vilāpa Kusumāñjali – 60) “Nandishwar Giri is most dear to Sri Nandanandan and is even more worshipable for the people of Braj than Govardhana!” Krishna is always intoxicated by the taste of the blissful games he plays here with his friends. Sri Nand Maharaj engaged different expert artistic architects in making a square platform here out of large jewel-studded slabs of stone where his Gopāl could play with his friends. How many sweet and humorous pastimes of laughter and joking Sri Hari expands here with his friends! Das Goswami is a maidservant who has taken shelter of Sri Radharani’s lotus feet. Sometimes she goes to Nandishwar as a messenger who carries a message of virahiṇī Srimati, and sees Sri Krishna playing here on this platform. When Mādhava sees Srimati’s maidservant, he blooms up, as if his life is fulfilled! How wonderful is the majesty of Sri Radha’s love, that ānandamaya vigraha (Krishna, the embodiment of transcendental bliss) considers himself blessed when he sees her maidservant! Krishna is completely subdued by the love of Sri Radha, who is his pleasure-potency. Sri Hari, who perspires when he is repeatedly fanned by Sri Radha’s restless eyelids, who is agitated even when he lives in the city of her beauty and who remains thirsty, even though he drinks the nectar of her smile again and again, is the bestower of our delight! In his maidservant form, Das Goswami experiences how this wonderful playground called Āsthānī smells of Sri Hari’s lotus feet. 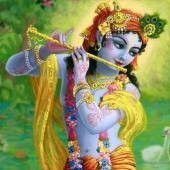 His heart and mind are intoxicated by this wonderful bodily fragrance. This bodily fragrance has the greatest influence on the young ladies of Braj! khasāya nīvī chuṭāya keśa bandha. Radha’s maidservants perceive how this fragrance maddens their mistress with feelings of ecstatic love. Das Goswami says: “I take shelter of this Āsthānī platform, which is scented by the fragrance of Sri Hari’s lotus feet!” As a result of such surrender, Raghunath Das Goswami always wishes to experience the sweet pastimes that are taking place there.